The streak is officially alive. 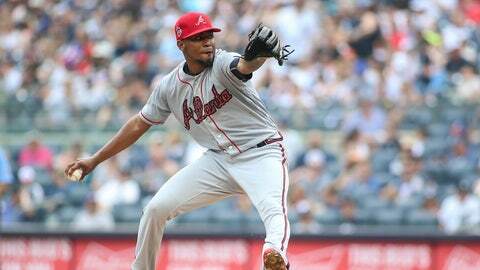 Atlanta Braves right-hander Julio Teheran is scheduled to make his sixth straight Opening Day start on March 28 against the Philadelphia Phillies, the Braves announced on Monday. The 28-year-old set the Atlanta record for consecutive Opening Day starts last season by breaking a tie with Hall of Famer Greg Maddux and Rick Mahler, both of whom made four straight Opening Day starts for Atlanta. Now, Opening Day start No. 6 moves him into a tie with Hall of Famer Warren Spahn for the modern-day franchise record. Teheran, a two-time All-Star with a 3.64 career ERA, is set to make the record-tying start after Atlanta’s No. 1 starter Mike Foltynewicz encountered elbow soreness in spring training, delaying his throwing program and setting him back to start the campaign. General manager Alex Anthopoulos mentioned earlier this spring that Teheran and left-hander Sean Newcomb were the most likely Opening Day candidates after Foltynewicz’s setback, saying the makeup of the Phillies’ lineup would help determine which pitcher gets the nod. Only two MLB pitchers have a longer active Opening Day start streak with his current team than Teheran: Seattle’s Felix Hernandez (10) and the Dodgers’ Clayton Kershaw (8). Barring a late-spring injury setback, Teheran will be the choice. Teheran made 31 starts for the defending National League East champions last season but was relegated to a bullpen role against the Los Angeles Dodgers in the NLDS, making only one appearance in Game 4 mop-up duty. Over the past two seasons, the former No. 1 overall pitching prospect in baseball has proven to be one of the sport’s more reliable workhorses — ranking 17th in innings pitched over that span — but he ranks in the lower percentiles in many significant categories among qualified starters. Dependability provides value, though. Teheran is one of only four pitchers to log at least 175 innings in each of the past six seasons, joining Max Scherzer, Jon Lester and Mike Leake. Teheran, a product of Cartagena, Colombia, turned in a strong spring training leading up to the announcement. Through three starts and 12 frames, he holds a 3.00 ERA with 16 strikeouts and only one walk while holding opposing batters to a .222 batting average. He’s now pitching exclusively from the stretch — an alteration similar to the one made by teammate Kevin Gausman after the Braves acquired him at last year’s trade deadline — while working under new pitching coach Rick Kranitz. Walks were an issues for Teheran in 2018, posting a career-worst 4.3 per nine innings, but Anthopoulos said earlier this offseason that was partially by design as Teheran intentionally lived on the corners, leading to a career-best strikeout rate and the third-best opponent wOBA of his MLB career. Teheran owns a 2.73 ERA in his five previous Opening Day starts. The Braves will not carry a five-man rotation into the 2019 season behind Teheran due two off days built into their first two series against Philadelphia and the Chicago Cubs.